The quickest way to add products and services to an opportunity is to use the picker. 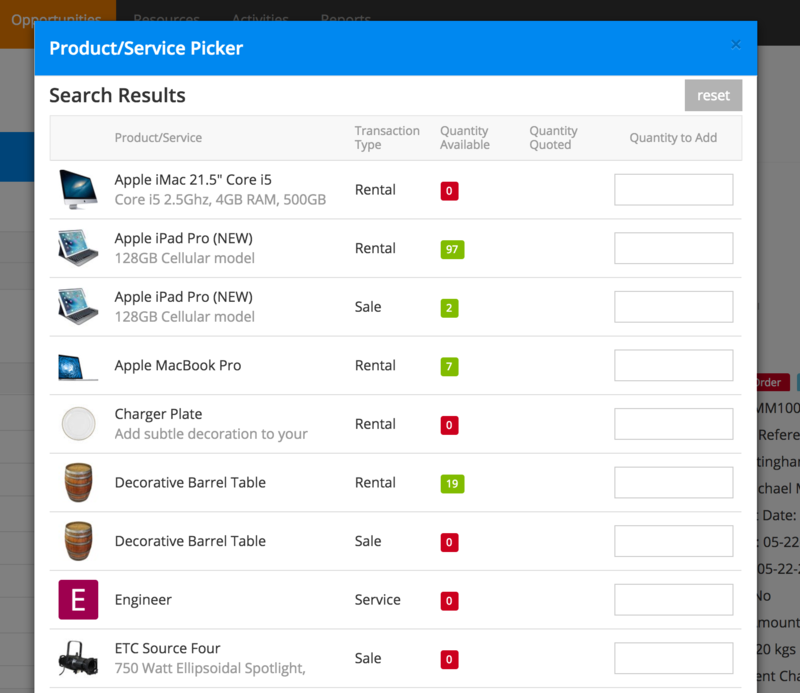 Use the picker to search all of your products and services and swiftly add multiple items at once. You can add products and services to drafts, quotations, and orders. Inquiries are for capturing general information so you won’t see the option to access the picker. Click Convert to a draft under Actions to start adding items. 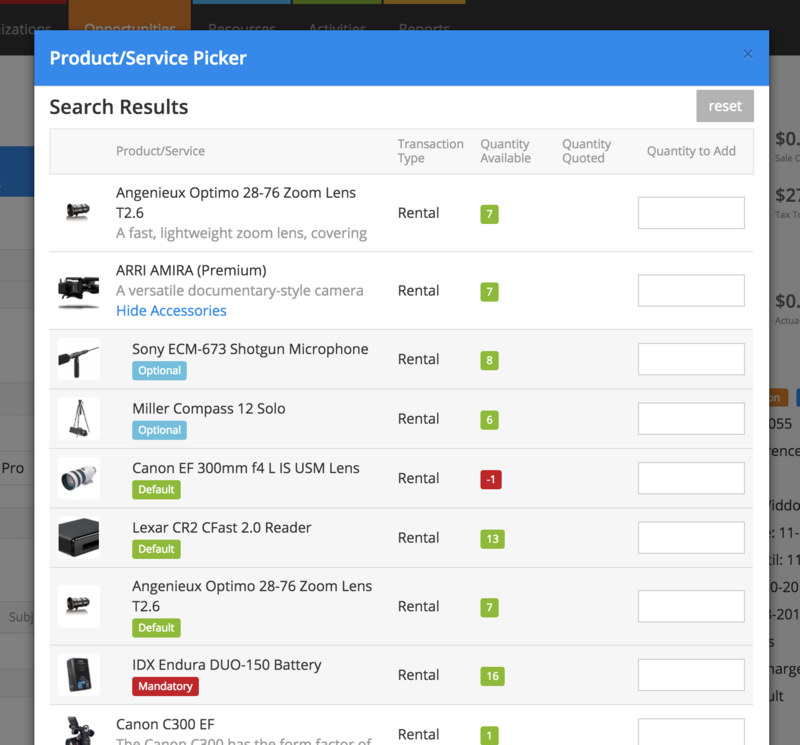 To access the picker, click the green show picker button at the top-right of the items list. Alternatively, press ctrl + alt + p to bring it up. Click Favorites at the bottom-left to bring up a list of favorites, or search by name, product group, service type, or tags. Combine these to perform detailed searches of your products. In the example below, a search for “i5” in the product group “Computers” with the transaction type “rental” and with the tag “Apple” brings up any kit in the Computers product group, tagged with Apple, with an i5 processor mentioned in the product description. Conversely, search more generally by leaving fields blank. For example, leave all fields blank and choose a particular product group to bring up the first 100 items in that product group. When you add a service to an opportunity, you can choose the dates that you’re supplying a service for. For example, you might add a “Transport” service for the first day of the opportunity only. 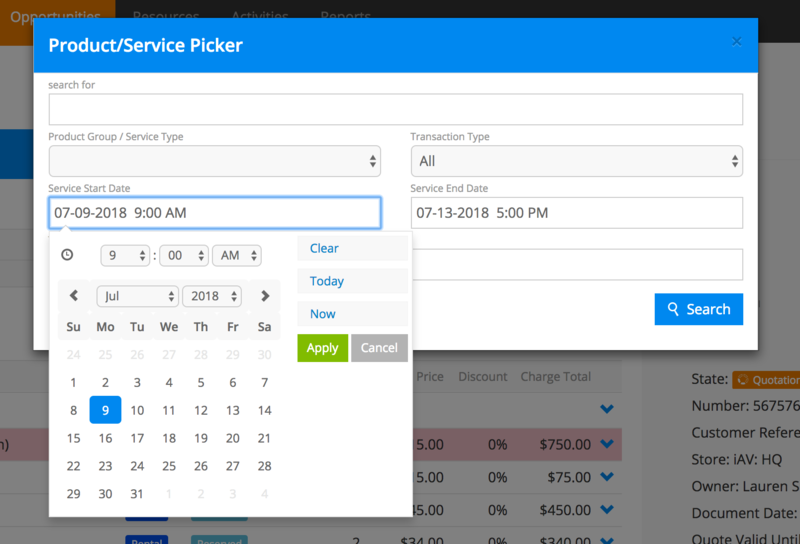 Use the “Service Start Date” and “Service End Date” fields to specify the dates for the services that you add using the picker. When you click search or hit ↵ enter , Current brings up any matching results. As well as the item name, you’ll see a thumbnail, one line description, transaction type, and availability figures to help you make decisions about which products to add. Add products and services to your opportunity by typing a number into the quantity to add box to the right of a product name. You can enter figures for as many items as you wish on the search results screen. When you’re done, press the green add button to add these to the opportunity. The picker is optimized for keyboard use. Hit the ↹ tab key to move through all of the quantity to add fields and press ↵ enter to add items to your opportunity. Items are added in the background and you’re brought back to the search fields so you can begin searching again, making the picking process really quick. If a product has accessories, use the “show accessories” link to add and change accessory quantities. All availability figures are updated in real time; Current will mark items as quoted for as you add them to a provisional quotation and remove them from the quantity available as you add them to an order or reserved quotation. For products, availability figures are determined by the start and end date of the opportunity. For services, the “Service Start Date” and “Service End Date” set on the picker are used. If you overbook, Current will let you know. Shortages are highlighted in red on the items list if you’re working with a reserved quotation or an order. When you’re done adding products, click the blue x at the top-right or tap ESC to close the picker.